Kyle Perkovich and his family accept the award from Dollins Group representative Neil Johnson for the win in the $10,000 1/35m Jumper Classic. Crete, IL – June 18, 2017 – Showplace Productions’ Spring Spectacular II wrapped up with competition in all seven show rings, awarding ribbons and prizes to riders of all levels from the Grand Prix ring down to the Short Stirrup. 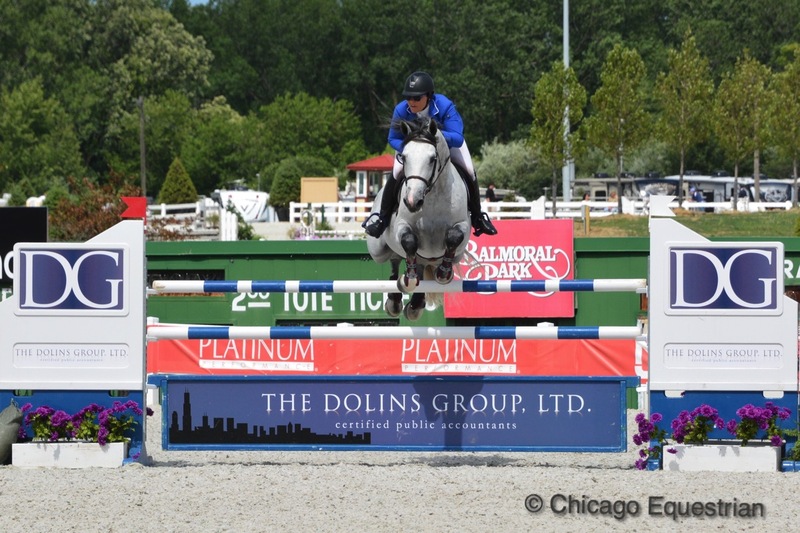 The new HITS Balmoral Park venue has plenty of room for everyone, yet spectators gathered around the Grand Prix ring later in the day to take in the $10,000 1.35m Jumper Classic sponsored by the Dollins Group. Nine riders out of 24 made it to the jump off round over the Guilherme Jorge designed course. Jorge of Brazil, designed the courses for the 2016 Rio Olympics and other top International competitions and this week set some difficult tracks with long gallops in the jump offs, making for exciting classes. 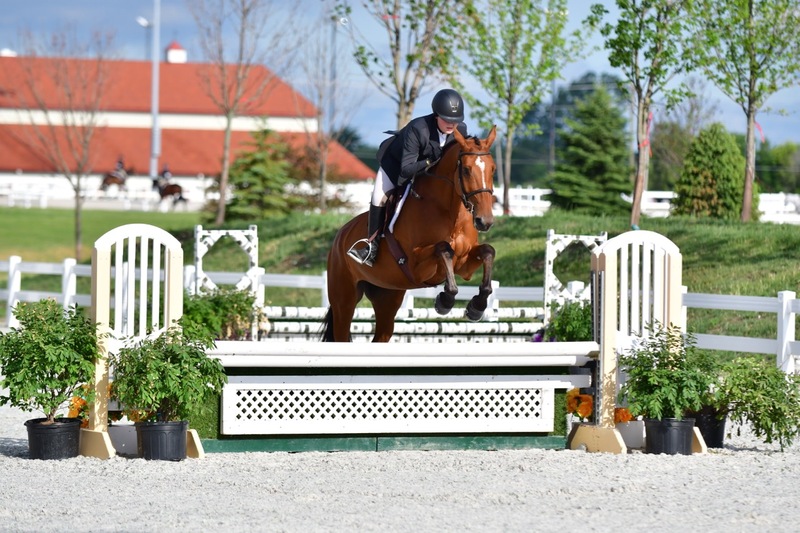 David Jennings on Woodrun Farm’s Carmina set a tough to be beat time of 34.915 seconds in the jump off early in the class and held the lead until the very end when Kyle Perkovich and Roc My World flew over the course in 33.953 for the win. Perkovich chose the A option to return to jump off at the end of the class. The smart choice paid off, allowing the horse to rest between rounds and to let Perkovich know what he had to beat for the win. Kyle Perkovich and Roc My World. Perkovich, 15, has been paired up with Roc My World for some time now. The eleven-year-old mare is out of the famous Roc USA stallion, owned by local Chicago area trainer/breeder Nancy Whitehead, who has earned awards for being the Leading Breeder. 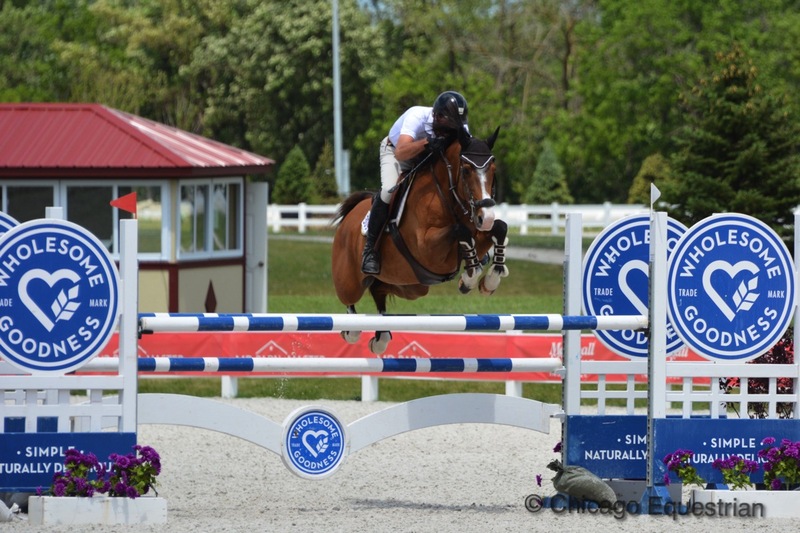 Perkovich rides at Red Coat Farm in Hawthorn Woods, Illinois and won the Showplace $150,000 Marshall & Sterling 1.30m Jumper Series last year with the athletic mare. His trainer, Mary Goldman, earned the Leading Trainer Award. Already this year, the pair has some major wins prior to the Showplace Spring Spectacular Series, including the $5,000 NAL Junior/Amateur Classic at the Showplace Spring Classic. 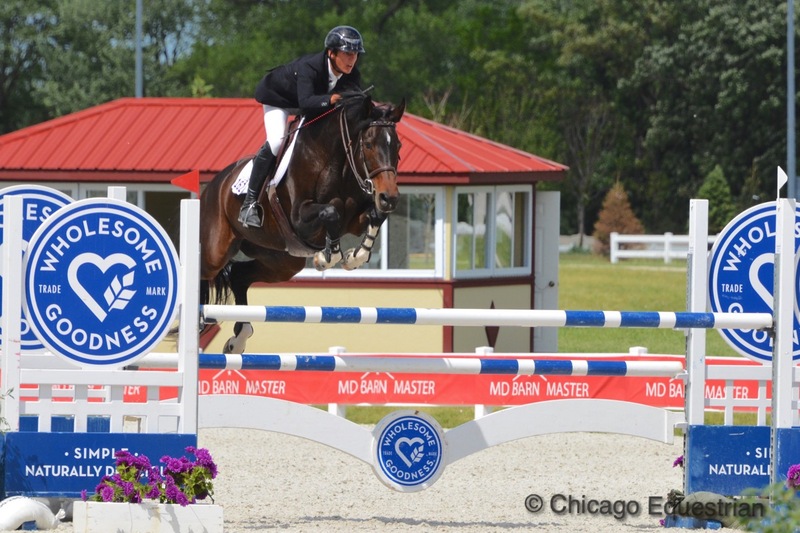 With a second mount now, Tresor Du Perron, Perkovich will keep moving up the ladder in the grand prix ring. 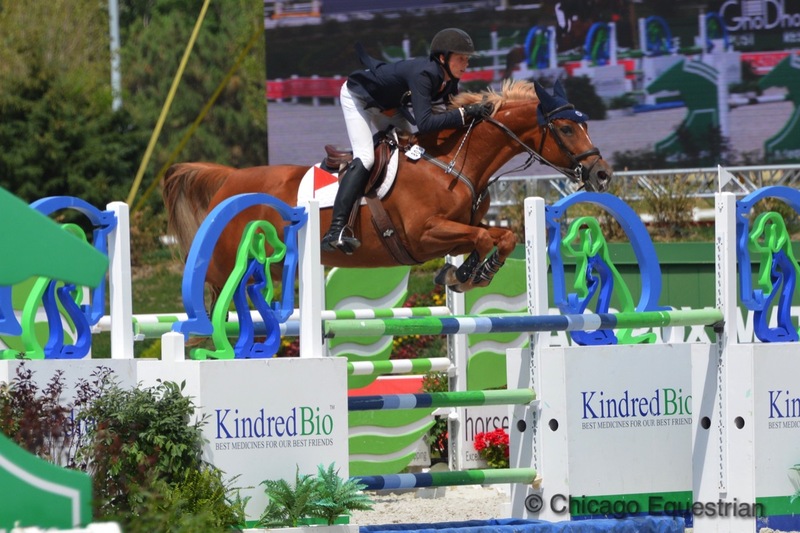 Jennings recently won the $30,000 Grand Prix at Brownland on Carmina after a successful Ocala season. Jennings picked up the rides for Woodrun Farm and Troy and Laura Linback, who have a location in Mundelein, Illinois and also in Ocala, Florida, after Laura had a tragic accident at HITS Ocala last year and suffered a traumatic brain injury. Since then, she has made an amazing comeback with physical therapy geared toward riding again. She is back in the show ring a year later. Third place winner Taylor Flury knows about brain surgeries as well, when back in 2005, she was diagnosed with chairi malformation, a defect in the cerebellum causing severe headaches and mood swings. At 15-years-old, Flury had surgery with a year of rest and rehab and since then, she is full speed ahead, developing young horses for her family’s AliBoo Farm in Minooka, Illinois. She sped to a time of 35.642 on her Carrasca Z, a seven-year-old stallion they have developed with an impressive resume, including being the first American bred stallion approved by Zangersheide. Brian Moggre and MTM Flutterby. Fourth went to Brian Moggre, Flower Mound, Texas, aboard MTM Flutterby. 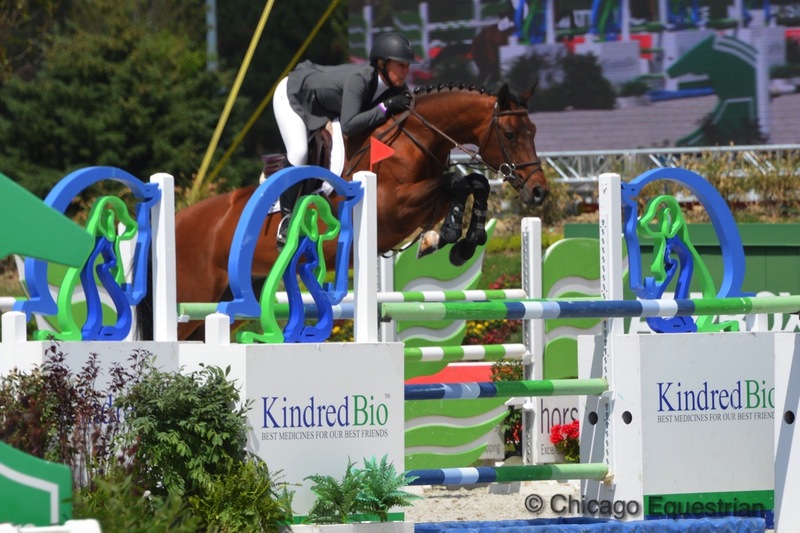 Moggre is another 15-year-old sensation taking the grand prix ring by storm, already earning a bronze medal in the North American Junior Young Rider Championships in 2016 on MTM Flutterby. Moggre won his first grand prix in 2016 on MTM Ace of Spades, just days after his 15th birthday. Moggre rides with Mike McCormick and MTM Farm. The Dollins Group, a full service CPA firm located in Northbrook, IL, sponsored the class. Their mission is to provide proactive tax, accounting and consulting solutions; enabling their clients to receive the best financial and tax advice available. Johnson got hooked into the horse world by his wife, Vicky Johnson, who rides hunters with Tievoli Farm. Last year the Dollins Group was a sponsor at Showplace Spring Spectacular and has a great relationship with show manager, Pat Boyle. When Johnson heard about Balmoral Park, he was totally on board for the grand horse show venue. Successful horse shows like Showplace Spring Spectacular can offer top prize money thanks to sponsors like Johnson. Hayley Gassel gave her dad a great Father's Day present with her win in the $5,000 SJHOF Jumper Classic with Quite Dark 2. Winning the $5,000 SJHOF Junior/Amateur Jumper Classic in the Grand Prix ring was Haley Gassel of Knoxville, Tennessee, on Quite Dark 2. The pair is another great comeback story since the horse had a minor injury in October requiring rest and rehab; they got back into work in February. This is only their third show back and Gassel says he feels better than ever. They have been a team since 2013 when they imported him from Germany. Her dad, originally from Chicago, accompanied her in the winner’s circle with more family that came to watch and support. Her dad rarely makes it to horse shows so for him to not only come to watch but to see her win on Father’s Day made it one to remember. 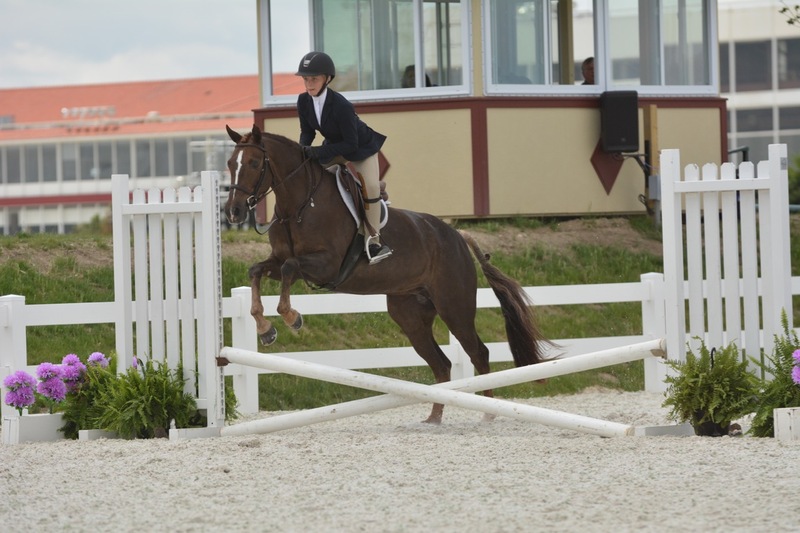 From top riders jumping big jumps to beginner and young riders jumping little jumps, Showplace Spring Spectacular can handle it all. In the Short Stirrup Ring, Dani Gascoigne and Garrison Forest were the Short Stirrup Hunter Champions with Rachel Hall and The Editor taking the reserve. In the Long Stirrup Division, Monica Possekel and Noel Matine won the hunter championship and Sandman with Gianna Mangiaraina took reserve. Mimi Rothman and At One's Word. Photo Andrew Ryback Photography. In the Hits Hunter 1, Mimi Rothman stole the show with her At One’s Word, winning the division championship with Allison Orth taking the reserve with Candy Land. Stefanie Collier and Lelantos. Photo Andrew Ryback Photography. Stefanie Collier took the championship with Sophia Pantzer’s Lelantos in the Hits Hunter 2 section with Abigail Dvorak-Peat taking reserve with Jessica Glad’s Lindheart. In the Children’s Hunters 14 and under, Maddie Fisher and Beachin’ took the championship with MTM Retro, owned by Hays Investment Corp., took the reserve spot with Catherine Kramer. On Tuesday, June 20th, Derbies will take over both main rings for the Showplace Derby Day featuring the $25,000 USHJA International Hunter Derby presented by Bull Run Farm, the $10,000 USHJA National Hunter Derby sponsored by Galway Farm, the $2,500 Balmoral Child/Adult Hunter Derby and the $2,500 USHJA Pony Derby sponsored by the Markman Family. Gene & Georgetti with Michelle Durpetti will sponsor a fantastic VIP brunch. For a schedule of events, go to www.showplaceproductions.com. 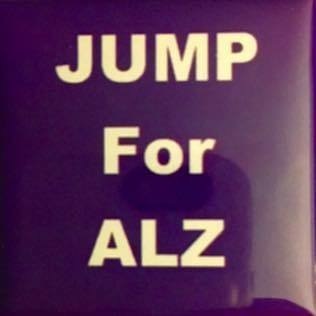 June is Alzheimer’s Awareness month and the fundraiser is in support of those families affected by the disease. Proceeds will help to eliminate Alzheimer's disease through the advancement of research; provide and enhance care and support for all affected; and reduce the risk of dementia through the promotion of brain health. Be sure to donate! For more information click here. 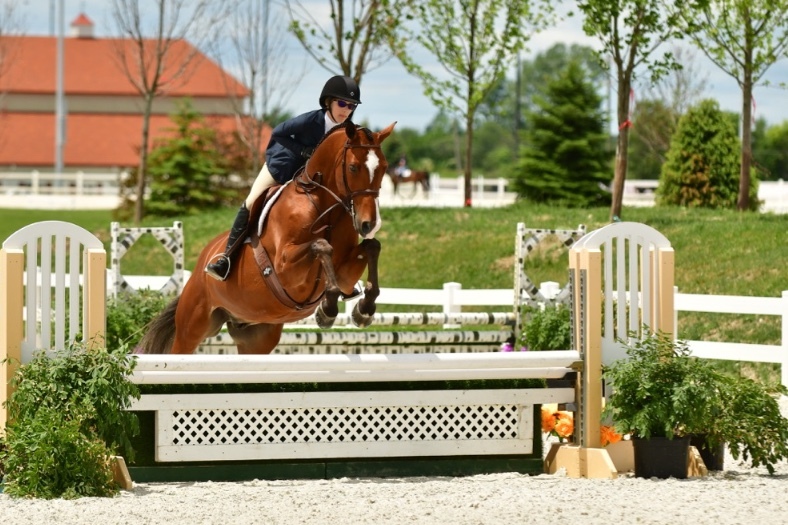 Millennium Farm in Hawthorn Woods, Illinois, offers lessons, boarding, training, sales and showing for hunters, jumpers and equitation. 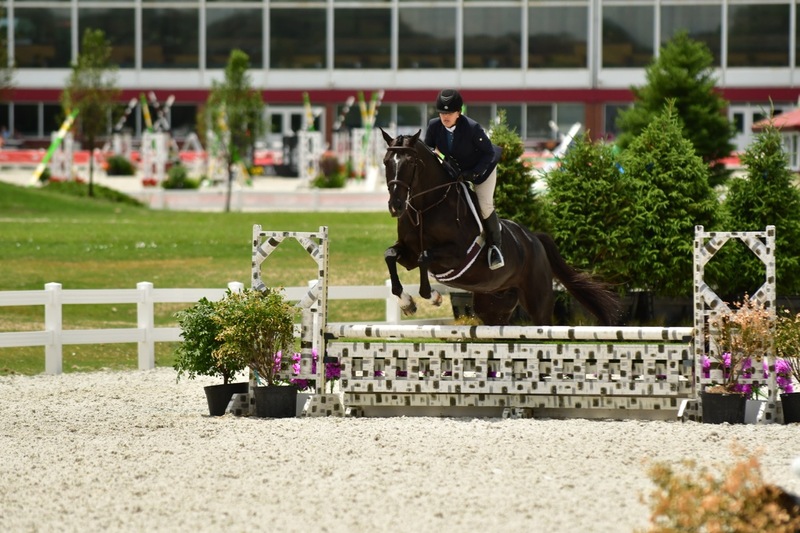 Trainers Sue Leverick, Katie Leverick and Dana Christiansen provide riders with a well rounded program for both horses and riders in a fun and friendly environment. Sue Leverick is a United States Hunter Jumper Association (USHJA) Certified Trainer, producing champions in all divisions. Katie Leverick and her grand prix horse, Replique. 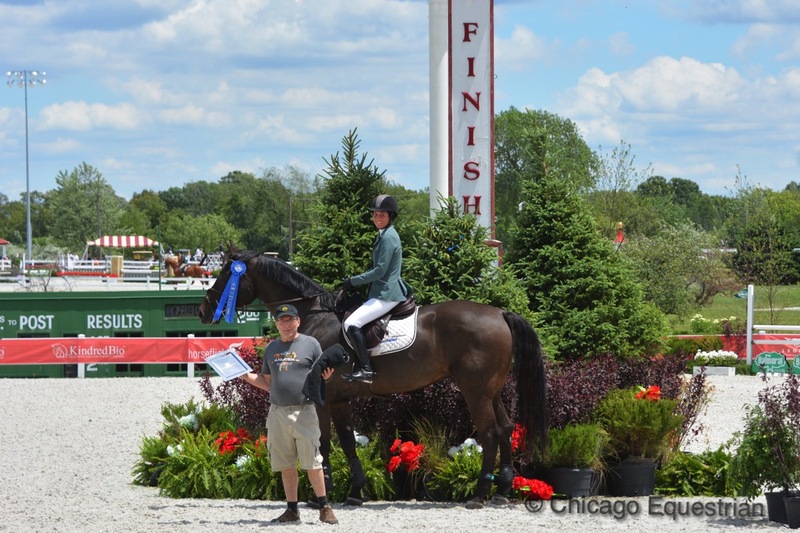 Photo Chicago Equestrian. 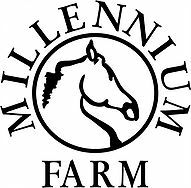 Millennium Farm is a USHJA Recognized Riding Academy offering lessons for all levels of riders from beginner to grand prix. Showing is available on the A, B and NIHJA circuits and highly qualified guest trainers occasionally give clinics at the farm as well. Millennium Farm offers both basic board and full service training packages. They have large 14x14 matted stalls and a wide matted aisle, a spacious indoor, two outdoor arenas and 14 grass paddocks for turnout. 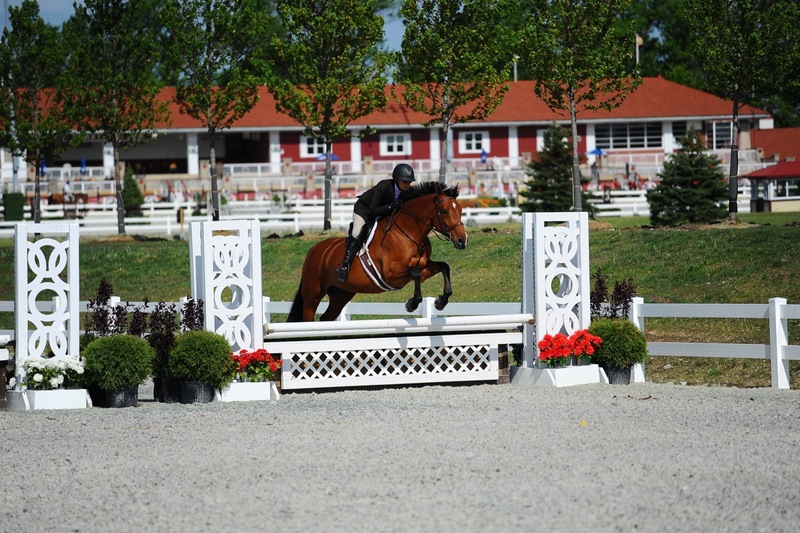 Millennium Farm's summer camps are designed for riders of all levels from newcomers to those who are jumping and ready to horse show. Check out their camp options here. Contact them for a personal tour.